New In Personalised Gifts from £8 at Moonpig Shop a wide range of gifts at Moonpig you can personalise to make that present extra special. Including, Mugs, tote bags, t-shirts and more! Next Day Delivery on Orders at Moonpig-Order Before 7.30pm Running out of time to send your loved one a gift? Don't worry, order by 9pm and you can get next day delivery! Jam and Preserves from £5 at Moonpig-Perfect Gift! Looking for something sweet to send with your card? Shop jam's and preserves at Moonpig from £5! Discover Gift Boxes from £25 at Moonpig Shop the amazing gift boxes at Moonpig to send to your loved one. For an extensive range of greetings cards, flowers, wines and more - for whatever you want to say and whatever the occasion - Moonpig has the perfect match. Gone are the days of humdrum cards filled with monotone poetry to tell someone how you really feel, now you can do the talking yourself with a personalised number and if you're stuck for words, a great choice of chocolates, tipples, wall art and more is bound to do the trick for you. Now that birthday list won't be so daunting, with Moonpig and even Moonpig reminders, you will always stay on the birthday ball. Sending greeting cards is as easy as pie, with a choice of top rated and popular numbers to flick through at your own ease. Order before the cut off to get your cards to where they need to be on time and you'll be the true friend, best girlfriend, most thoughtful bro or kindest daughter all-year round! With beautiful goods that are printed to the best quality, Moonpig will never cease to impress and let you have a giggle with some of their fancy-free card anecdotes too! How do I use my Moonpig voucher code? Click ‘Apply’ and continue to complete the transaction. Make your money go further by adding Prepay credit to your account. You'll get an extra 25% to spend on cards and gifts to treat another on their special day, see here for more details. 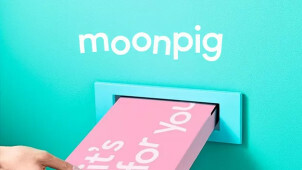 Does Moonpig offer free delivery? Delivery starts at as little as 64p for First Class postage with the Royal Mail, so while delivery isn't completely free - unless we have a cunning offer for you - you'll hardly notice the cost! What are the order cut off times? For you or the recipient themselves to get their card the next day, you should place your order before 7pm to make the First Class delivery service. It is also 7pm for flowers, then 4pm for plants, t-shirts, calendars and more. Check the full list of cut off times here. Does Moonpig offer student discount? This isn't currently available, but stay in touch with vouchercloud and we'll let you know of other offers and if anything changes! Where can I track my flower order? It's easy to see whereabouts a gift delivery is by signing in to your Moonpig account. You will just need your order tracking id which can be found in your order history. Standard UK Card Delivery with the Royal Mail takes 1-3 days and starts from 64p. Prices are product dependent, do see here for full details. Call 0345 4500 100 or send them an email. Customer Services are open from 8:30am until 9pm Mon-Fri (except Bank Holidays. For all those summer occasions, where better to find a card than at the online personalised service Moonpig? For birthdays, anniversaries and other occasions, you can use a Moonpig voucher code from vouchercloud to save on its extensive offering. For the busy, forgetful and those with great taste, Moonpig.com is your ticket to getting in their really good books on every occasion. There’s a fantastic Moonpig app available for both Apple and Android devices. For those really oops I forget their birthday moments, now you don't have to be on your PC when you can order a gift or card on the run using your iPhone, iPad, Android phone or tablet. It’ll make it much easier to organise last-minute gifts too, so you’ll never arrive empty-handed. You must know by now that we're a fairly generous bunch, so when it's the occasion to gift another, we like to go all out. Flowers always do the trick, plus when you can save with a magical Moonpig discount code this summer, it's easy as pie to pick up the perfect plant or bouquet that'll make someone smile. For your mum on her birthday, your loved one on your anniversary or even when no special occasion is on the horizon but just to say that you're there - roses, lilies and more will make the perfect gesture every time.